If you like pancakes, you'll definitely love this dish. It is not the usual sweet fluffy pancake,far from it. 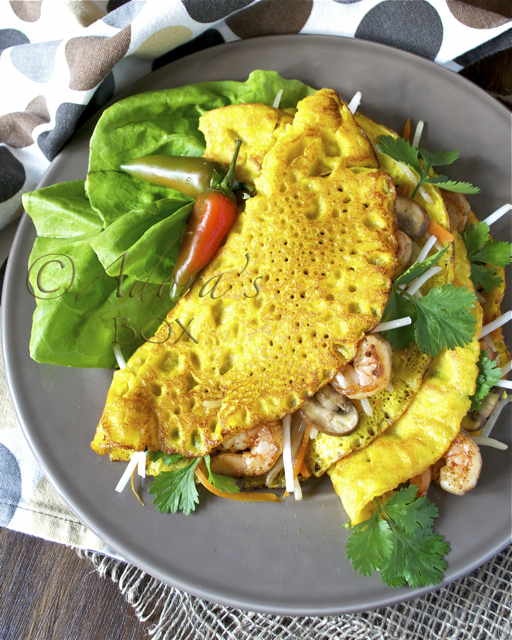 These are Vietnamese style pancakes (banh xeo) are made with eggs, coconut milk and rice flour. The pancake is crisp on the outside and gets its unusual taste from the coconut milk. The filling I used here is prawns with mixed vegetables. I think the way it is eaten is very interesting and exciting. A portion is wrapped in lettuce leaf and then dipped in a sweet and hot garlic chilli dip. It is a simple dish but the combination of all the ingredients and textures makes it so delicious. This is ideal as an appetizer but may also be served as a side dish. I could happily eat this all on its own. First saute the shredded carrots in 2 tbsps. of oil. Add the mushrooms, garlic and light soy sauce. Stir fry for a minute before adding the prawns and spring onions. 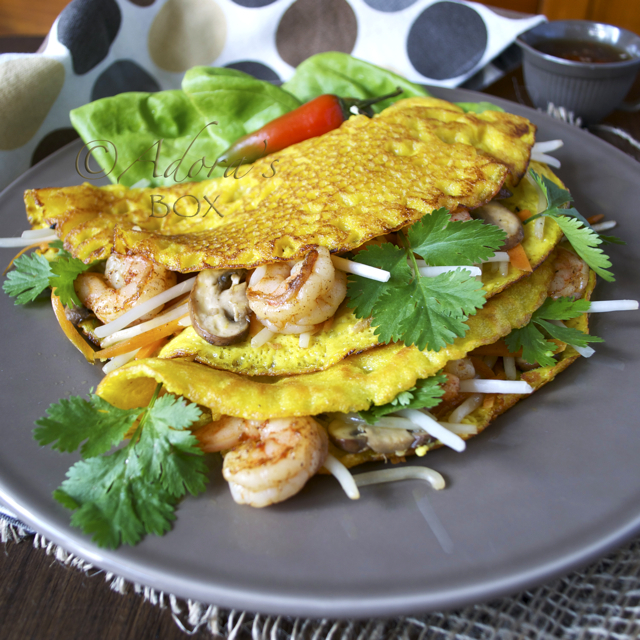 When the prawns turn pink, add the beansprouts and coriander leaves and transfer to a dish. Divide the filling into four portions. Prepare the pancakes. For the pancakes, combine the rice and corn flour, turmeric and sugar. 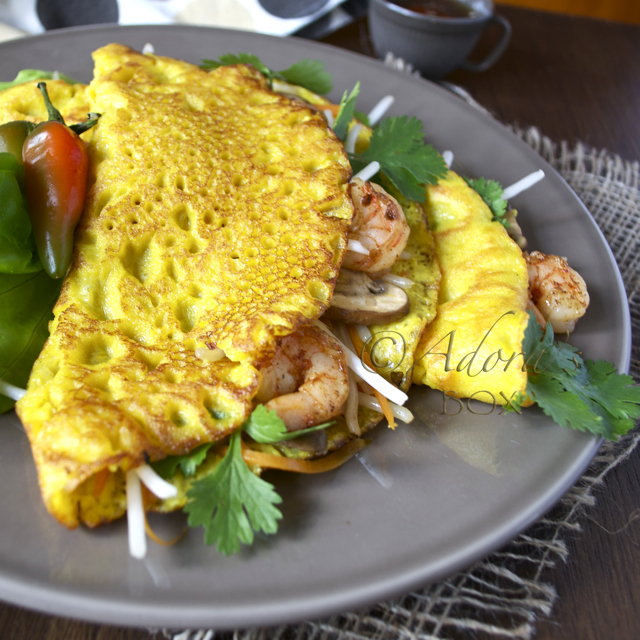 Combine eggs, coconut milk and fish sauce then gradually stir into the flour mixture to make a smooth batter. Heat 1 tbsp. of oil, and pour in 1/2 cup of the batter (this recipe makes 4 pancakes). Cook on medium heat. When the pancake is nearly done (the underside should be crisp and the top should be nearly set all over), spread one portion of the filling onto the pancake. Cook for one minute, covered. Fold the pancake in half and transfer to a serving dish. Repeat with the rest of the pancakes. 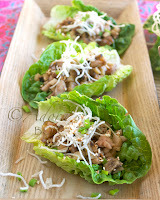 Serve with lettuce leaves and garlic chilli dip. Mix all of the ingredients together until the sugar melts. 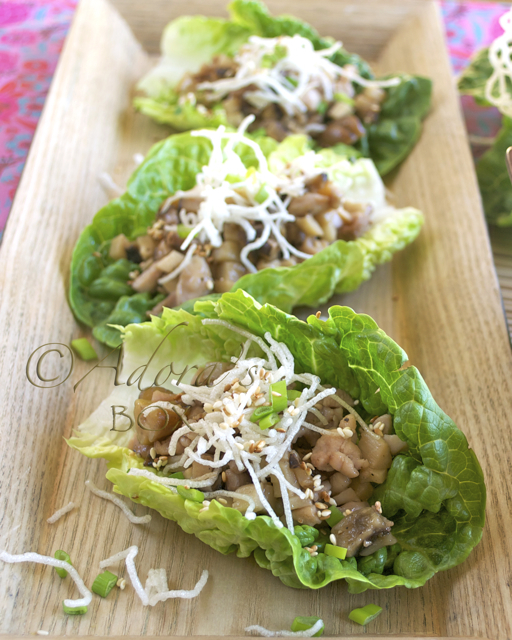 Serve as a dip for the pancake and lettuce wraps. Adora, these are one of my favorite Vietnamese foods. They are called Bahn Xeo. They also usually contain small (thumb-print sized) bits of fatty pork or bacon. Great to see you cook them from scratch. This looks so yummy! One of my favorites, besides the spring rolls..ate so much of this the last time I was in Saigon. Will definitely be making this soon! Thanks for sharing!